There has been a lot of talk lately, about whether full adults should read young adult fiction and why (or why not). There was a recent Slate piece that essentially asserted that adults should stick to adult stuff and that young adult fiction is beneath them. Well, if you've been following my blog or any of my social media accounts, I'm sure you know how I feel about that - it's complete bull. I fully believe that well-written young adult fiction contains as much complexity and grit as many full-adult books. The Hunger Games trilogy makes its own compelling case on the subject: this isn't just some cute story about teenagers in a love triangle. It's serious and violent, and like its dystopian predecessors, it creates a stark future using elements of our historical past and present. 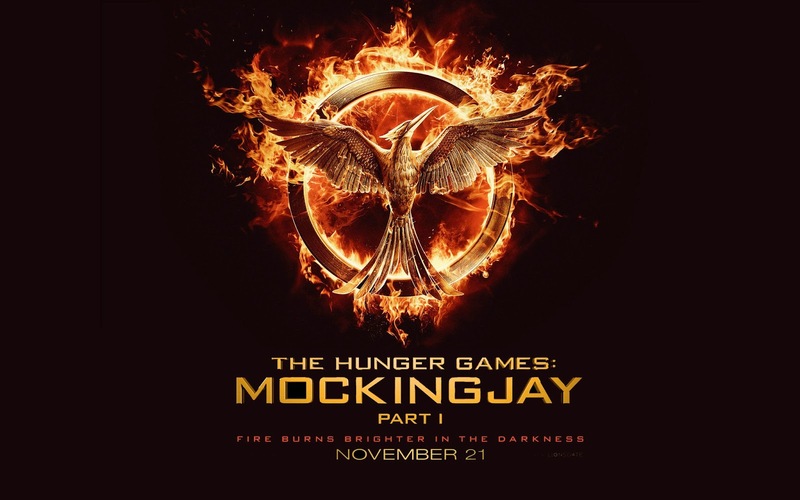 While there is death and violence in each installment of the trilogy, Mockingjay really kicks it into overdrive as the grand finale of the series. In the interest of total disclosure, it's the book that I've reread the least, and for good reason - it's the one that is the hardest to stomach. (I actually haven't revisited it in at least a couple of years.) It's not just the deaths of beloved characters and the violence with which those deaths occur (and yes, they are gruesome), but also the mental climate of our main characters, Katniss Everdeen and Peeta Mellark. Through the first two books, at least, there were moments of respite from the ugliness of their world, but in Mockingjay, the ugliness has really seeped inside their heads, and there is no escape. I remember reading it for the first time, at three in the morning one summer night years ago, clutching my hand to my chest because I'm kind of a lightweight and I have a really hard time stomaching stuff like this. So... the movie. The movie only covered half the book (since apparently all teen series finales are being split into two movies now), but it was a non-stop punch in the stomach the entire way through. The first two HG movies never glamorized the violence and brutality that was occurring, and likewise, I didn't feel like M1 (as I will now call it) glamorized war. One of my first thoughts after walking out of the theater was "That was UGLY," and I wasn't referring to the cinematography. I'm going to keep using the word "ugliness" in reference to this movie because that's what was in the book, and the movie brought it to life in a very visceral way. The gist of the M1 is that Katniss, Gale, and her family are now living in District 13 after the last games ended. District 13 was thought to have been reduced to rubble, but really, they've been living underground this whole time and now that rebellion has broken out all over Panem, they are ready to jump in there and lead. And they need Katniss to be the symbol of the revolution, so they talk her into shooting a series of promos, propaganda films, to encourage the other districts to rise. Part of this new role requires Katniss to visit her old district, which really has been reduced to rubble, and to visit another district, visiting the sick and wounded in a makeshift hospital. Katniss falls to her knees as she realizes that she's sitting atop a mountain of the remains of her former neighbors. The camera lingered on the destruction and the life-changing injuries long enough make me profoundly uncomfortable, not because I can't empathize, but because I empathize too much. I'm pretty sensitive to this sort of thing, which is why I pretty much never watch anything that has to do with war and violence. I felt my chest clench and fill up with horror, and I could see that Katniss felt the same way, especially when she sees bomber planes firebombing the hospital and all the innocent, wounded citizens inside, leaving no survivors. Meanwhile, Peeta has been in the Capitol this entire time, having been captured at the end of the last games (in the last movie). In contrast to Katniss' messages of uprising, Peeta appears on Capitol TV a number of times to urge everyone to lay down their weapons, which of course would be to the Capitol's advantage. Every time we see him, his eyes get more sunken in, his face gets more emaciated, and he himself becomes more and more visibly shaken, a sign of the torture they are surely inflicting on him. Peeta is by all accounts the most lovable character of the series, in the sense that he has always been driven by kindness and caring - I know it's cliched, but he IS a lover, and not a fighter. Katniss, Gale, Finnick, and Haymitch... they all have some darkness within them, but I've never felt that was true about Peeta. Which makes his deteriorating condition all the more alarming, in the book and especially on-screen - Peeta, who is such a good character, is having bad things done to him, and we cannot stomach that. And then we get to the end, and oh my goodness... The climax of the movie focused on the rescue of Peeta, Johanna Mason, and Annie Cresta from the Capitol (so, no mention of the surviving career tributes from CF), and it was so incredibly intense that I think all the muscles in my upper body were locked up. It intercuts footage of Finnick revealing some sinister secrets with footage of the rescue team (which includes Gale) storming the tribute center in the Capitol and with reaction shots from Katniss. Even though I knew they would make it out, I still couldn't breathe. (However, I nearly lost it as Katniss sobbed, "Did I lose them both tonight???") The lighting and the slightly grainy footage from the soldiers' helmet cams as they moved through the dark building made it look horror-movie-esque, especially when they stumble upon what looks to be a science lab, and one soldier is looking around in horror, saying, "What IS this place?" I had trouble unclenching my fingers until it was over. And then we got to the worst part. Katniss finds Peeta, and at first, his back is to her and to us, so we can't yet see his face, but we know it's going to be bad. When we finally see his face in full view, it is bruised and beaten, not in an "Oh, this is Hollywood, so we still have to keep him kinda handsome" sort of way, but in an "Oh my god, this guy was absolutely subjected to violence and brutality" sort of way. I didn't cry because the sight of him shocked my tears away. And it wasn't just the physical change that shocked me (as well as Katniss and every person in the theater), but it was the expression in his eyes, or lack thereof. Kudos to Josh Hutcherson for making this Peeta absolutely NOTHING like the Peeta that we all know and love - this Peeta that we see is utterly damaged inside and out. Peeta attacks Katniss, and the struggle is equally alarming and ugly. He attempts to strangle her (and this is no stylized Hollywood fight, but one person brutalizing another), and I'm assuming this was done in post-production using a computer, but the veins in Katniss' eyes were bulging and red, and even in the ensuing sequences, they were still red and veiny, as she was still recovering from the attack. It was a very, very difficult and disturbing thing to see, and again, I had my hand clutched to my chest to assuage my own horror. The movie ends with an intercut of President Coin proudly addressing District 13 and announcing their next plan of attack and of a horrified Katniss watching Peeta thrashing against his restraints in a hospital bed, in a profoundly heartbreaking (and not at all comical) way. I'll be the first to admit that I haven't read Mockingjay in a while, so I can't speak to the changes made for the movie, but I WILL say that I've never felt this affected by the first half of that book before. The second half, definitely (which makes me dread the last movie), but the first half of the book never hit me in the gut the way that this movie did. And I'll admit this too - I'm not sure I want to see this again. Not because it was bad - I thought it was a really good movie - but because I'm just not equipped to witness this sort of thing. I don't think I will ever be desensitized to the horrors of war (nor do I think I SHOULD be). I spent the whole movie feeling like I would cry, and it wouldn't have been an uplifting, cathartic cry like with TFIOS, but a traumatized I-can't-handle-this-violence sort of cry. There could not be a more definite statement of "This is not a game anymore" than this movie. Oh, and let's not forget that the movie prominently features Katniss singing "The Hanging Tree," which is no jolly Christmas carol. Hearing it as the backdrop to hundreds of rebels getting gunned down at point-blank range by Peacekeepers added a whole new level of somberness. So, Slate... do you still think that YAF is undignified, indulgent, escapist fluff that adults should be embarrassed to read and watch?